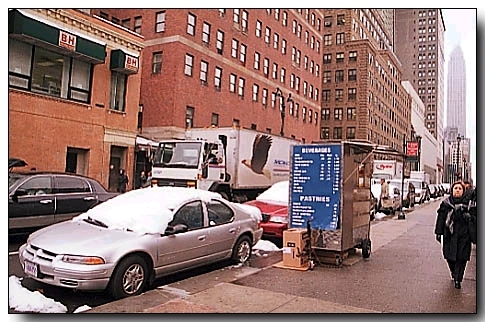 In April 2003 I was for only a few days in New York City; while I had expected to be able to enjoy early spring in New York, I was arriving on a day that New York experienced the heaviest April snowfall in over 20 years ! Because of the weather, I decided to cut things short, took care of business and went for a long stroll, while doing my shopping. Jumping over large puddles, remains of melting snow, I found my way to "Ground Zero". I was shocked to find myself trampling thru the snow... My feet were cold and wet upto my ankles. 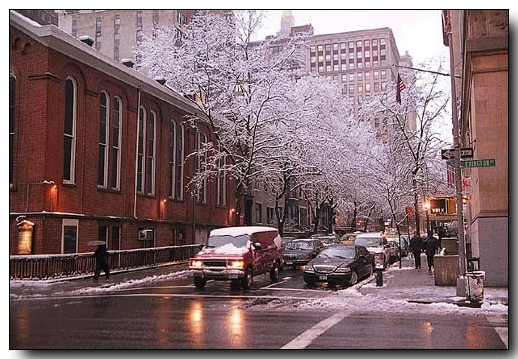 But the little street where my hotel ("Murray Hill Inn" on East 30th and Lexington) was situated, had small trees and they had taken a fairy-tale image with the snow on the branches. Another snowy image. For people in New York very much routine of course, but for me, it differed from the image I had of New York compared to previous visits. 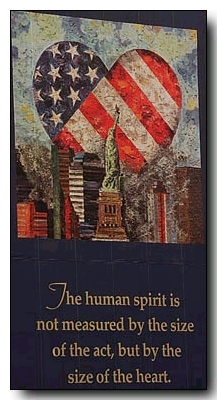 It was years ago since I had visited New York City and of course I was looking for the traces which reminded of September 11th, 2001. 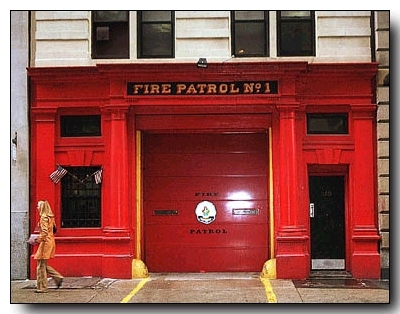 Since the firemen of N.Y. played such an important role, my eye fell on this establishment. I found New York had pretty much gone back to the routine of every day life. Well, what else can you do ? People hurried along, like people always hurry along in N.Y. and the streets and pavements looked untidy and represented the financial state the City in New York has always seemed in: flat broke. 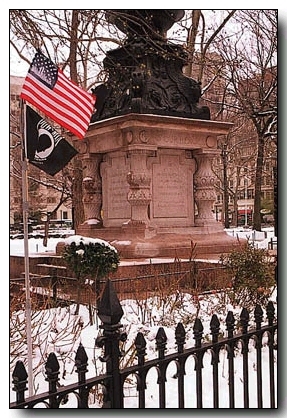 But the parks always look pretty and the small Stars & Stripes and the P.O.W. flag flying here, reminded people (those who took the time) that the US was again waging a war. My favourite store in New York City: B&H Photo and Video ! Their 35,000+ sq. ft. Superstore is located on the West Side of Manhattan at 420 9th Avenue between 33rd and 34th streets. I think there isn't much around that they don't have and at excellent prices. I stepped outside again (have been shopping on occasion with B&H since 1980s) with a very pleased feeling ! Ground Zero ! On my last visit the Twin Towers still stood proudly and tested my fear for heights. Now there was nothing more than a cold and dreary building site. One tall building had still a protective canvas around it and the photo on the right shows the tapestry, of the building next to it, in detail. 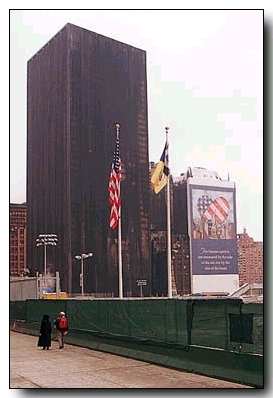 In memory of the proud, towering buildings devastated by the terrorist attacks on "Nine / Eleven", this remains. No doubt a memorial more elegant will be resurrected, but this is what it all boils down to. Back in my hotelroom, I witnessed the last statues of Saddam Hussein been torn down in Baghdad: the war against Iraq had arrived in its final days, a war allegedly connected to the terrorist attack of "9/11".